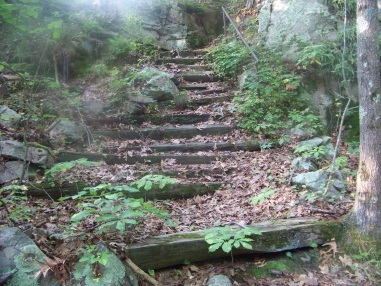 Hiking trails are not the first thing that comes to mind when visiting the town of Hull. The land mass that makes up this town is comprised of a 7 mile peninsula that juts out into the lower portion of the Boston Harbor and helps form the boundary between the harbor and Massachusetts Bay. 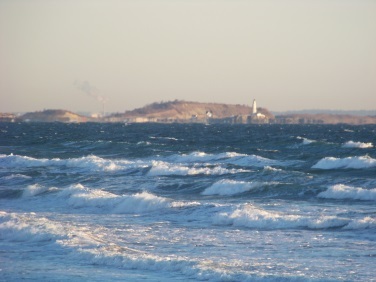 Picture perfect Nantasket Beach becomes extraordinary on wind swept days! The foremost prominent feature of the town is Nantasket Beach. With water on three sides of the town, plenty of beach, access to Boston Harbor, the islands within and the Weir River Estuary, hiking trails can take a back seat. One of the Boston Harbor Islands, Peddocks Island, is among land that is part of the town of Hull. are some out of the way places to hike and scenic areas to walk as well. Nantasket is the name the Massachusett Indian of the Wompanoag tribe gave to this peninsula. It's meaning is low tide place or at the strait. Another interpretation found says it means " the place between the tides" as at high tides the area came close to being an island. The peninsula being a series of islands connected by sandbars is an interesting place to visit! For such a small land mass area, the peninsula contains 8 hills that are drumlins formed some 14,000 years ago by a glacier! Between these hills are tombolo's, the sandbars that connect these "hill islands" together. Travel to Hull is usually done by following route 228 into town. 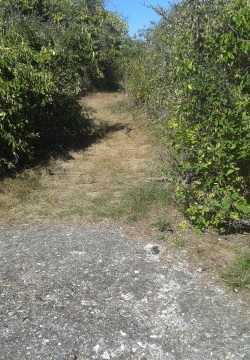 This is a very short route that begins near the Rockland / Norwell line at the Route 3 exit 14 area. The route begins here and travels and ends just before the crossing of the Weir River and Straits Pond area and at the intersection of Rockland St and Jerusalem Rd. It intersects route 53 and route 3A before it ends giving the visitor a few more options for traveling into Hull. Another often traveled route into Hull is the George Washington Boulevard which leads out of the rotary in Hingham on route 3A. As you come around the corner, the beach area lends itself to a spectacular first view. Initially the Plymouth Colony used Hull or "Nantascot" as a trading post. Here the colony traded with the Wompanoag Indians beginning in 1621. The following year in 1622 was when it was first settled. It was incorporated in1644 and named after an area in England called Kingston upon Hull. Interestingly salvaging shipwrecks was another industry most likely due to the very rocky shore at it's boundary with Cohasset. As early as 1634 Telegraph Hill was considered an area useful for protection of Boston and it's harbor. In 1673 a beacon was erected as an early warning system of enemy ships entering the harbor. In 1775 fort Independence was built atop of the hill. Later renamed Fort Revere in honor of Paul Revere. Another important feature of Hull's history is it's lifesaving efforts. A group known as the Lifesavers were formed to save the lives of those shipwrecked off Hull's coast. This group became the fore runner for the modern day Coast Guard. The beginning of this effort was with the Massachusetts humane society placing huts of refuge on Nantasket Beach after the American Revolution. 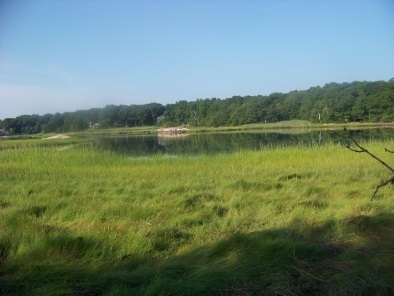 Later boat houses for lifeboats were placed at Stoney Beach near Cohasset. In 1889 the United States Life Saving Station was opened on Point Allerton. Hull's most famous lifesaver, Joshua James lived at this station. In the early 1800's tourism began in Hull. In 1825 the Sportsman Hotel opened on Nantasket Ave. Soon other hotels followed. By 1840 regular visits were made by steamboats. A steamer known as the Steamer Rose Standish regularly frequented Nantasket Beach. In 1905 Paragon Park opened. At that time it was considered a rival of the World Fair the ultimate entertainment of it's day! Hull is also the location of the first lighthouse built in North America as the town seal depicts and still a feature of it's shoreline. 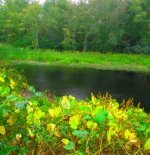 An intriguing hidden forest that leads down to the side of the Weir River Estuary where you will find marsh grasslands teaming with wildlife activity. it is only fitting to include that! hike section of this website. from the harbor side of Hull is certainly agreeable. Want to know what's going on in Hull and the surrounding area? Try What's up in Hull!